Wow - from this geek's point of view, Sony's compact team are on fire! I have always liked Sony's attempts at cramming as much tech in to a picture taking box as possible, all the way back to the original F, V and R series. I don't know if this model will tempt out my credit card (I still like changing lenses too much), but it is a compelling little box of tricks, especially with that pop up viewfinder! It seems as if Sony will keep Mks I, II and II all on the market at the same time (according to SGNL anyway). The Mk1 is down to £359 in the UK, but it has been cheaper. Looking at the information released on SAR, DPReview etc. the RX100III looks like a camera I will want to purchase. I like the wider lens and the addition of the EVF in an envelope just slightly thicker than the RX100 I own to accommodate the lens. I am still waiting for the pricing to see how "greedy" and discriminating Sony will be. US$800 translates into near enough £500 plus VAT 20% = £600. They will probably want £750 to penalise us with £150 because we are "suckers". Maybe I should look at HK prices. If I can get one at $800 then adding VAT and £10 costs would be a good deal. I would probably get the only defective camera Sony has made "to make my day". bakubo wrote: 320 shots using rear LCD. I am surprised that the little EVF uses so much more power than the big LCD. I always carry two extra batteries anyways. The RX 100 III would be a bit of an indulgence for me. But now with the faster lens and the EVF it is very appealing as a take everywhere camera. Perhaps by Christmas it should be at a better price. Okay, still surprising to me though. I wonder why a little EVF needs so much more power than a big LCD? Maybe one of the hardware guys here can tell us. pakodominguez wrote: I always carry two extra batteries anyways. Yes, I do the same for my E-M5. I have 3 batteries for it. From what little I know the OLED type displays are better than LCD for power consumption generally speaking but use more power than the latter when displaying light or bright coloured objects, so it’s just the amount of light coloured things you take photos of at times, scenes with white clouds and white buildings that kind of thing then the OLED uses more power than the LCD and if it has to compete with daylight it will probably consume quite a bit more. 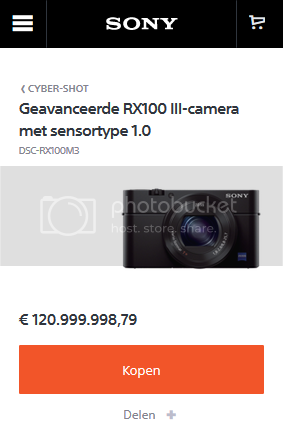 ps as mistakes go that price for the new RX-100 III is a whopper, I wonder if they'll get any takers, you never know strange things do happen, but maybe not that strange. Where did the 230 images with EVF come from? Not mentioned in Sony specification as far as I can gather. alphaomega wrote: Where did the 230 images with EVF come from? Not mentioned in Sony specification as far as I can gather. The dpreview first impressions review. The battery is the same as the one as used in the RX100 II: the NP-BX1, which offers up 4.5Wh of power. The latest version gets fractionally fewer shots out of it: 320 according to CIPA standard testing. This drops to just 230 if you use the electronic viewfinder - something worth being aware of, when you use the camera. - built in EVF and no hotshoe (just like the Sony RX100m3). Pannie have a new 1" sensor FZ1000 similar idea to the RX10 but f2.8 to f4 with a longer zoom, that's saucy enough at £750 odd but somewhat better than the asking price for the RX10. Not to jack prices up and try to gouge out customers. Not that I expect £50 cameras to have a 1" sensor, but the £250-£300 sector needs work. Sometimes the camera industry doesn't get it just looks like a cash cow to me. I'd be reluctant to pay £700 for an APS-C camera, there is no way I'd pay that for a 1" sensor. I played around with an RX100III a couple of days ago at a Bic Camera on Okayama. Seemed pretty nice and the popup EVF worked well. I had a sudden urge to just buy one right then and there for about US$800. Then I remembered that Sony cameras in Japan have the Japanese only menu that can't be changed to another language -- unlike Canon, Nikon, Olympus, Pentax, etc. Sony lost a sale of an A700 to me in 2007 because of this same issue. Sony lost another sale of the RX100III. Considering all the non-Japanese who live in Japan it is a strange corporate policy. By the way, I never make impulse purchases such as this and I am glad now that I didn't buy it. Seems like a nice, small, always with you camera (the RX100 and RX100II without any kind of VF are of no interest to me), but $800 is steep. By the way, I also handled the Sigma dp2 Quattro at the same time. Whew! That thing is pretty big. Definitely an outside the box design. Weird.